Welcome to the Andrew Csafordi Studio Gallery! Encaustic Sculptural Painter, Andrew Csafordi, and fibre artist & photographer, Tara Wilkinson of Love Nest Studio Gallery, share their passion for art with art enthusiast art lovers to their Galleries and Studios on their beautiful country farm. 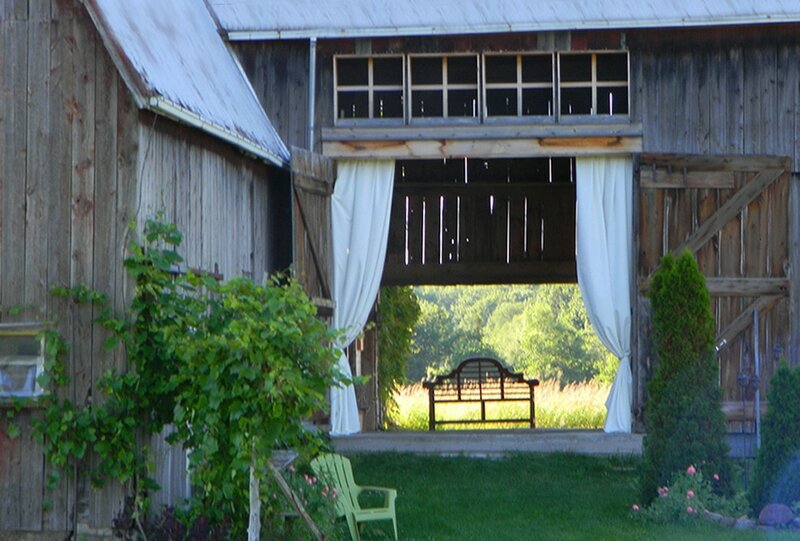 Celebrating 11 years of living and creating in beautiful Prince Edward County. Through each contemporary encaustic sculptural painting, artist Andrew Csafordi brings the viewer into an organic sky, landscape, or imaginative fantasy unlike any other. His luminous, textural paintings reach out and draw the viewer in. Rich layers of imagination, using pure beeswax and Damar tree resin as the painting medium. Each work takes you on an imaginative trip. Come visit us when you are in Prince Edward County! We are open daily from April through the end of October. Discover encaustic fine art in the Gallery and learn how Andrew creates. Connect and develop your creativity. Whether you're an art lover or art collector, ​my goal is to help make art an enjoyable part of one's life. Andrew is a graduate of the Ontario College of Art (1980) majoring in drawing & painting, communication and design. He has continued to consistently paint, sculpt and exhibit his art throughout his 30-year career as a creative director, professional graphic designer and illustrator with his own graphic design studio. Check website for Event and Show listings where Andrew's work can also be viewed and purchased. We are proud member galleries of the Prince Edward County ARTS TRAIL ... a self drive tour of over 25 studios and galleries open year-round (check individual listings for business hours). Look for the Arts Trail / Taste Trail Guide available at locations throughout the County. Find us in the Arts Trail Guide and online at www.artstrail.com. October 25th, or by appointment off-season. In our transformed century-old Barn, you’ll find several gallery spaces where you can enjoy Andrew’s distinct encaustic beeswax and mixed media sculptural paintings. Relax on our straw bale sofa and let your eyes take a walk “inside” Andrew’s paintings. "Andara Gallery" so also look for us with this new name! We will also have a newly built gallery at our location. We are proud to be " Trip Advisor Certificate of Excellence!" Visit our listing "Andrew Csafordi Studio Gallery" and add a review if you have been to visit. Thanks to the reviews of many happy visitors and art collectors, we are ranked as one of the top "Things to Do" near Bloomfield, Ontario, and in Prince Edward County! In his studio, Andrew offers two-day Encaustic Painting Workshops. Encaustic painting is fun and easy, using natural aromatic melted beeswax and oil paint mixed in for colour. A very friendly medium, the fast drying time allows one to create captivating works that will ignite the imagination. The warm liquid wax is applied to a wooden surface with brushes. Each layer is then gently fused using heat, resulting in a luminescent painting. Relax and be inspired while painting in a casual studio environment in the tranquil countryside. The results will delight and surprise participants. No experience is necessary. Workshop fee includes a workbook, all materials, light refreshments and snacks. See Workshop section for more info. The Andrew Csafordi Studio Gallery & Love Nest Studio Gallery are located in the heart of beautiful Prince Edward County, an island located just south of Hwy. 401 & the city of Belleville, Ontario. Andrew & Tara invite you to explore their websites and get in touch. We hope you will come and visit us and fall in love with some art.